The date is Wednesday April 15. It's game one of the playoffs. The Chicago Blackhawks are in Nashville for what many expect to be a very closely contested series. One period in, the score is 3-0 Nashville. Hawks goalie Corey Crawford was very shaky in the first, allowing 3 goals on 12 shots. The game is slipping away. I'm not sure whether to call him a star, a cult hero, or an internet darling (I swear, no pun intended), but this goalie from Lemont, IL became more than just a backup. He stopped all 42 shots he faced, and the Blackhawks came back to win the game in double overtime. 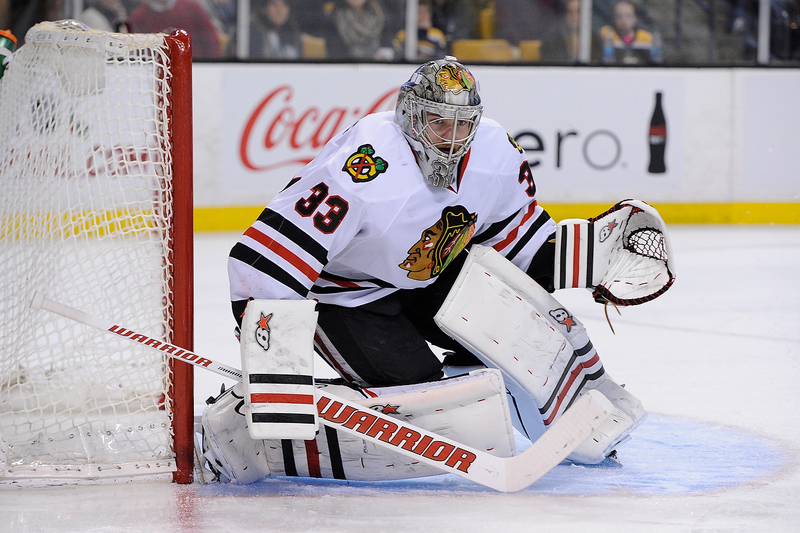 Great game from Darling, but it just made sense for the Blackhawks to return to Corey Crawford in Game 2. Darling's career was only 13 starts deep, and despite playing well in those starts, the sample size wasn't large enough to justify pulling the starting goalie after one bad period. Quenneville did just that, and the Preds proceeded to put up a 6 spot on Crawford in Game 2. Now the decision was easy. Crawford wasn't up for it, it was Darling's time. In his first start, he stopped 35 of 37 shots, as the Blackhawks took a 2-1 lead in the series. Two nights later, Darling reached his zenith. He made 50 saves on 52 shots in a triple overtime thriller in Chicago, as his team moved one win away from advancing to the next round. These numbers aren't really doing him justice. Saving 85 of 89 shots over 8+ periods of hockey in two nights is outstanding enough, but the way he reached those numbers was even better. A lot of the saves he was making would have been impressive even for the Prices, Lundqvists, and Rinnes of the world. He had people questioning if he was even of this species. In fact, Darling was even outplaying the opposing goalie, the aforementioned Pekka Rinne, during his time in Games 1, 3, and 4, which all ended in wins for his team. The good play continued for the first two periods of Game 5, a only Filip Forsberg was able to get past Darling with about five minutes left to go in the first. The score was 1-1 after two periods. Three minutes and fourteen seconds into the final period, the Preds were leading 4-1 after scoring twice in the last twelve seconds. Now, the goalie position was in question once again. The alien that possessed the body of Scott Darling had disappeared at the end of Game 5, and it wasn't clear whether or not it would ever return. All eyes were on the backup goaltender to begin Game 6, and 11:16 and 3 Predator goals in, Quenneville (presumably) sighed and called on Corey Crawford again. Crawford shut out Nashville for the rest of the game and the Blackhawks went on the win and advance. What happened to Darling was simple: regression. He's a backup who got hot, and he the hot streak ended. We may see Darling again between now and June, or we may not. Either way, it was a damn good run while it lasted. Let's get on with the division by division previews. As always, when I give best and worst case scenarios, I'm assuming the general health of their roster, because I'm not a psychic. If I were, I would have objected to becoming a Mets fan ten years ago, but I'm a mere mortal. We begin with the AL East. Team Outlook: Last year's division winners are in a good position to repeat as AL East champs as they pretty much stood pat this offseason. They're even adding talent, in the form of Matt Wieters about a month into the year to replace the offensively bad (in that they were so bad at offense that I was offended) combination of Caleb Joseph, Steve Clevenger, and Nick Hundley. Manny Machado will be back to start the year after missing the final month and a half with a knee injury. Chris Davis and Jonathan Schoop were so bad for large chunks of the year that there should be natural upgrades at first and second base as well. There are concerns that their pitching staff will take a step back. Even so, their roster is still above average as a whole. This is a really good team who decided to run it back in 2015, and they should be successful. Worst Case Scenario: 84 wins. This is contingent on not only the Os regressing themselves, but the BoSox and Blue Jays taking steps forward, making this division tough to navigate. Best Case Scenario: 100 wins. After 96 wins last season, Wieters is a massive upgrade behind the plate, Chris Davis is at least consistently average, and the rest of the team repeats their performance from last year. Player to Watch: Kevin Gausman. Gausman was one of the top prospects in baseball prior to last season, and after pitching well to start the year in AAA, he was called up and provided good #2 starter production when he wasn't constantly bouncing between Norfolk and Baltimore. He's a flamethrower, averaging 94.8 MPH on his fastball, on which he is heavily dependent. As he starts to work in his off-speed stuff a bit more, he should be one of the best pitchers in baseball. He won't start the year in the rotation, but it won't be long before he gets the nod.